This guide provides: information on Denison's collection of print maps and atlases; links to online collections of maps, atlases, spatial data; and background information necessary to interpret maps and other cartographic information. CONSORT also contains records for a large number of electronic maps. For assistance locating maps please ask at the Learning Commons Desk. Denison University has been a member of the Federal Depository Library Program (FDLP) since March 17, 1884. In addition, we were a member of the U.S. Geological Survey Depository Program until it merged with the FDLP. These programs insure that the American public is informed about the activities of the government by distributing materials published by the federal government to institutions free of charge. In return those institutions promise to house materials and provide the staff necessary for the students, faculty, and general public to use these materials. Under these programs, Denison has received thousands of Geological Survey topographical maps in both the15 minute and the 7.5 minute series. These series divide the country into units sized in 15 and 7.5 minutes of longitude and latitude and show topography and structures. (A minute is 1/60th of a degree of longitude or latitude.) 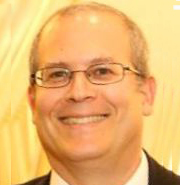 Denison University serves as the principal map depository for the CONSORT system. In addition to these two major series, there are other maps which show plate tectonics, volcanic activity, land formations, even Antarctica. The U.S. Geological Survey Miscellaneous Investigation series and shaded relief maps are part of the collection. Many of these maps are useful to geologists and geographers and were lovingly collected over many years by Geology professor Richard H. Mahard. 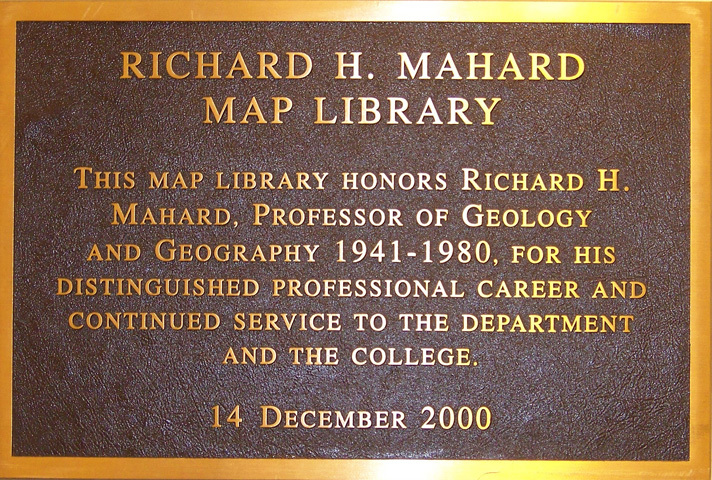 Dr. Mahard loved maps. He taught a course at Denison in 1943-44 on map reading for the U.S. Army in World War II. 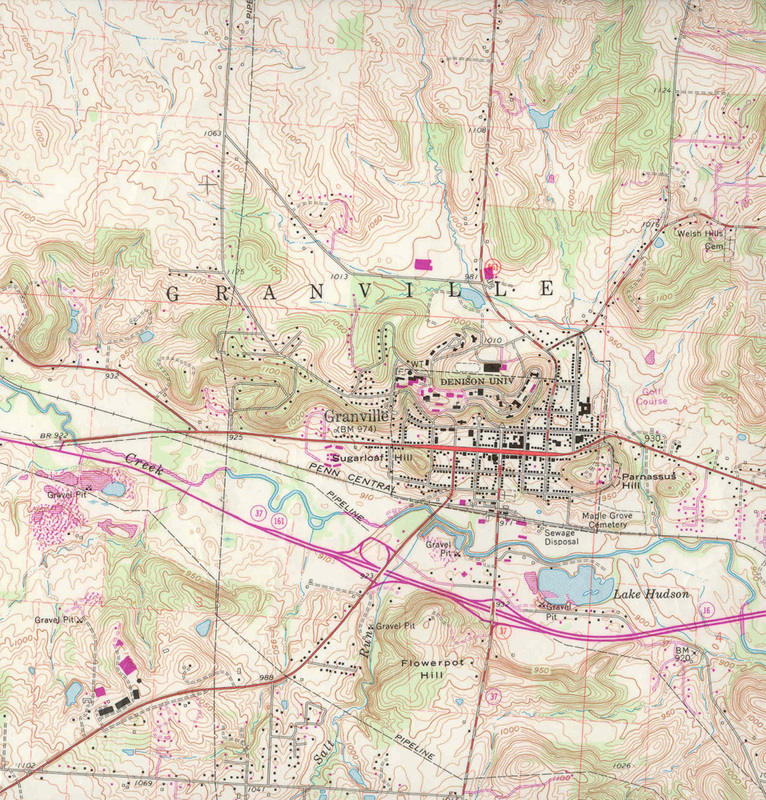 One map that he enjoyed showing off was a 15 minute quadrangle of Granville, surveyed in 1907 before the availability of modern computers. He was very impressed with the accuracy of this map and the skill of the men who made it. Much modern mapping is done from satellites in space. This provides us with unprecedented detail and accuracy. Previously, maps had to be made from direct visual observation at ground level and careful measurement. This is reflected in the 1907 Granville map.